Co-founder and co-host of the show, Mike Palecek is a writer who lives in Saginaw, Minnesota, west of Duluth. He was fortunate to attend Friends Central School in the late '60s to hone the already strong core beliefs instilled in him by his parents Wayne Lawrence and Marjorie Mock Gregory. His education continued at Wesleyan University where he earned a Bachelor of Arts degree with majors in Math and Theater, then some years later at Nova University (now Nova Southeastern) where he gained his Masters in Computer Science. Frank Cordaro is a member of the Des Moines Catholic Worker. He is a former Catholic Priest. 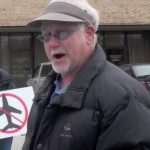 He has himself spent years and years in federal prison for crossing the line at Offutt, and more recently has been jailed for actions against the drone facility in Des Moines. Today the FBI raided the Phil Berrigan CW House in D.M. Phil is a weekly guest on our show. Philip A Farruggio is son and grandson of Brooklyn, NYC longshoremen. He is a free lance columnist (found on WorldNewsTrust.com, TheSleuthJournal.com, Information Clearing house, Op Ed News, Dandelion Salad, Activist Post, Dissident Voice and many other sites worldwide). Philip works as an environmental products sales rep and has been an activist leader since 2000. In 2010 he became a local spokesperson for the 25% Solution Movement to Save Our Cities by cutting military spending 25%. Azzurra is a monthly columnist, appearing in the first week of each month. Anthony is a monthly columnist, appearing in the third week of each month. Anthony Rayson is an American anarchist activist and author. He runs the South Chicago ABC Zine Distro and publishes many zines and pamphlets. DePaul University Archives and Special Collections holds a collection of Rayson's zines, as well as his compiled political writings and works of incarcerated persons. Anthony tirelessly communicates with prisoners all over the USA and publishes their writings. Larry James Pinkney is an American political activist. A former member of the original Black Panther Party, and the Republic of New Africa, he served nine years in prison in Canada and the US. Pinkney also served as co-chair of the San Francisco Black Caucus in the early 1970s, and later, as chairman of the Black National Independence Party. Julius is a Cameroonian living in Cameroon. He is a researcher in Political Science specialized in Political Conflicts and African Politics. Julius has a world of experience gathered from his home-based business where he has been typing and editing students' research works. He is bilingual in English and French languages. At the international level, Julius has worked for seven years with the Canadian Vote Sizing Institute based in Vancouver. Since 2010, Julius has been volunteering as African Correspondent for the New American Dream Radio Show.